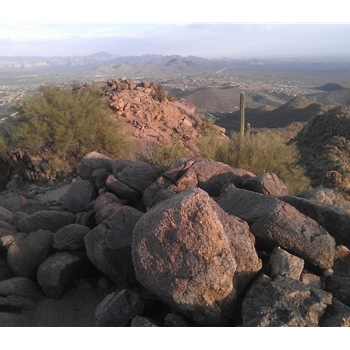 A moderate, in-and-out trail in the McDowell Mountain Preserve taking you from the Lost Dog Wash trailhead to the amazing views from Sunrise Peak. Trail Description From the trailhead area (newly renovated), take the signed Lost Dog Wash trail to the left (the trails and junctions are very well marked here). Coming to a junction in a 1/4 mile, take the Sunrise trail to the right. From this point the trail will climb steadily, crossing the Ringtail Trail, for about 1.5 mile to the ridge where the 136th Spur Trail branches off to the right. Keeping left on the Sunrise Peak Trail, you will reach the junction of the peak trail in about a mile. This last part is a steep zig-zag leading to the top of Sunrise Peak...well worth it! Once ready, take the same way back. Alternately, you can make this hike longer by continuing on the Sunrise Peak trail to the other side/145th Way trailhead.